It has been 15 years since the Indian Ocean Tsunami occurred. PLAJA would like to ask you to donate for the Indian Ocean Tsunami Memorial Service. The donation that you raise, we would make better use for memorial service. The memorial service of Indian Ocean Tsunami. 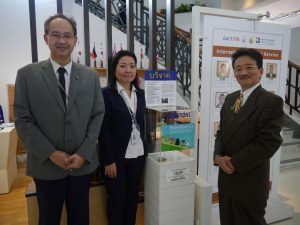 The monument is established at Kamala Beach Phuket, Thaialnd from activities to raise donations by the local Japanese volunteer. The monument and memorial service is based on donation from Japanese companies in Thailand and individuals. The memorial service is held on 26 December in each year to represent the memorial to the victims of Indian Ocean Tsunami regardless of nationalities and religions. In addition, PLAJA is organized the Society by the elderly of long stay in Phuket regardless of nationality. We are developing non commissioned business such as managements of support local activities or web site. The activities of PLAJA is made up of all the cooperation of as a volunteer, or donations from individuals and companies. We would appreciate if you could endorse our views and raise donations. Please contact us here.